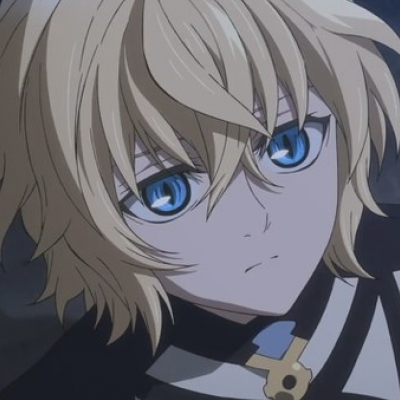 Mikaela Hyakuya (百夜 ミカエラ Hyakuya Mikaera, Birth name: Mikaela Shindo (進藤 ミカエラ Shindō Mikaera)) is Yuichiro's best friend and the other survivor of the Hyakuya Orphanage. Mikaela hatched a plan to escape from the vampire capitol with his fellow orphans. The attempt ended in a tragedy and he sacrificed himself in order for Yuichiro to escape from the city of vampire but then he was saved by Krul and turned into a vampire. For the next four years, he was forced to live with the vampires and in process, learning the truth about the experiments done to him and his fellow Hyakuya orphans by humans, causing him to hate both humans and vampires. He fights to meet Yuichiro and rescue him from the humans who are manipulating and experimenting on him and from the vampires who wish to enslave humans. Refusing to drink human blood, Mikaela drinks from Krul's blood instead and thus is not a complete vampire yet. He and Yuichiro (whom he calls "Yu-chan") care deeply about each other. In Season 2, he drinks Yuichiro's blood, with the latter's consent and urging, causing him to turn into a complete vampire.